I've been a blogging slacker over here, and haven't updated in about a month. How about some fuzzy shelties to make it up? On one of my favorite topics, Target printed out a coupon for me the other night for $1 off a "Fur Fighter Kit". 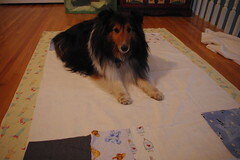 I got a huge kick out of it- I've never bought dog food there, so how do they know that I'm surrounded by sheltie fuzz? 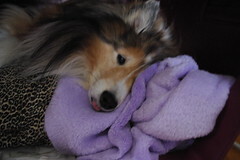 I do occasionally buy stuffed dog toys for Christmas or the sheltie birthdays, so that must be it. I really wish it had a "click here to see why we recommeded this" on the coupon, do 3 dog toys a year add up enough to recommend a fuzz fighter kit? Maybe I'm buying too many de-lint rollers? ?